Chasing dreams of their own photographic business, Ghillie Basan and her husband Jonathan swap the comfort of their Edinburgh home for Corrunich – a remote cottage at the foot of the Cairngorms. With jumping cows for company, the Basans begin their new life with no electricity and heavy snowstorms. Generators break down and roads quickly become blocked, but the couple have a series of adventures with a fascinating mix of local farmers, terrified tourists, an African president, and their two babies, Yasmin and Zeki. 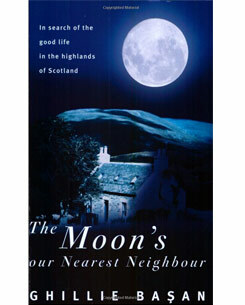 The Moon’s our Nearest Neighbour is a heart-warming, amusing account of a life lived in the picturesque beauty of highland Scotland; of the ferocious weather and the spectacularly starry skies; and, most of all, of the tremendous strength of spirit in coming to terms with the hardships and isolation of a new lifestyle.